PALM DESERT, CA - KDI Stoneworks, which began as a tiny husband-and-wife tile installation business operating out of the back of a Mazda pickup truck, has evolved and expanded its services since their humble beginning 17 years ago. They have grown so much in fact, they no longer felt their name truly reflected the wide scope of services they offer. This week, KDI Elements was officially introduced to the public, giving this well-established, $45 million (annual sales) company a fresh, new look. Along with the name change comes a new logo and a complete update to their marketing and image. To solidify what the company does, they have also added the slogan, "Beautifying where you live, work and relax." What hasn't changed? According to Annie Klein, Owner and President of KDI Elements - the company principles, services, leadership and employees remain the same. "We haven't sold the company or had any sort of merger," says Annie. "We just felt it was time to give KDI an image renovation and the response has been amazing." Based in Palm Desert, KDI Elements designs, manufactures and installs custom countertops, specialty stone, tile accessories, showers, tile floors, wood flooring, carpet and exterior living elements. KDI is where builders, contractors, designers and home-owners go for everything they need to make their design visions a reality. The company has an impressive 20,000 square-foot state-of-the-art manufacturing facility with a 3,000 square-foot Design Center that showcases their products and services. With over 300 employees, KDI is one of the largest employers in the Desert. The company has a non-profit arm of their business, KDI Kares, which reaches out to charities and the needy of the community. For more information contact Pat Shapiro at 760.345.9933. 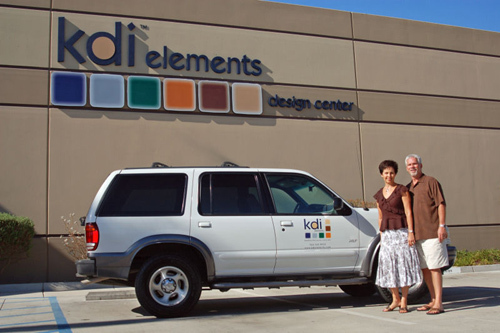 KDI Elements Owners Annie and Paul Klein stand in front of a truck with the new company logo. The company, known as KDI Stoneworks for 17 years, has only changed its name - not its leadership, employees or the services it offers.